Can you smell it? That hot, fresh loaf of bread as you pull it out of the oven? That has got to be one of the best smells in the world! With a Bread Maker, you can get all the smells and loaves of bread without all of the work. 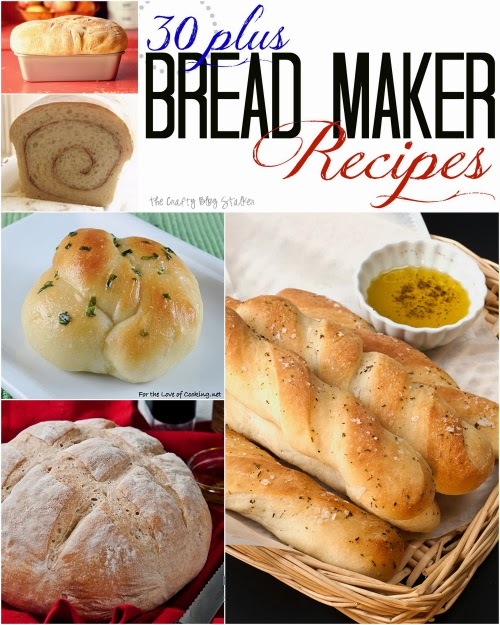 This collection of recipes includes the BEST easy DIY recipes for a Bread Maker or Bread Machine. Here you’ll see that a bread maker can make so much more than JUST a loaf of bread. Click the title below the image to get to the recipe tutorial. The BEST easy DIY recipes for a Bread Maker or Bread Machine. Delicious recipes to match any bread craving. The bread maker I use is this Oster 2-Pound Expressbake Bread Machine and I love it! Do you have a favorite bread maker recipe? Share and leave a comment below! SAVE 30 BREAD MAKER RECIPES TO YOUR FAVORITE BREAD RECIPES PINTEREST BOARD! I love a good bread machine recipe. I LOVE My Bread Machine! Thanks for sharing! I love making bread in the bread machine and search for great recipes. I can’t wait to check some out soon!!! Cool! I love getting new bread machine recipes. I love my bread maker! I’m always looking for new recipes to try. Thanks! Oh my, definitely pinning this for future reference. I so agree with you, there is nothin’ quite like fresh, warm bread. Thanks so much for sharing on Inspire Me Wednesday. Featuring you in next week’s issue. I use my bread maker nearly every day. It will be great to add some of these to the rotation! Oh my gosh, I absolutely MUST own a bread machine asap. These look awesome! I decided to get rid of my new bread machine because I hated the taste and texture of the few bread recipes I tried out… from the little recipe book that came with the bread machine. Now, I will try some of your recipes before I decide whether or not to trash it. The breads I made were soooo bad (many of them would never rise properly either) that I did not feel right trying to donate it. Maybe there is something wrong with the machine. Your recipes will help me find out. Thank you for sharing! You are welcome! Make sure that you are using good yeast. Old yeast will keep your bread from rising properly and that will effect the taste. I hope you find recipes that work well for you! Love all your recipes. Please tell me what brand and kind of bread machine you have. I’m going to get a new one Tuesday. My email address is all lower case. Mine is an Oster. It is a pretty basic model, but I think it works fantastic. I really appreciate it and am pleased and flattered! Thank you so much for featuring my cinnamon sugar pull-apart bread. I made it this year at Christmas in a wreath shape and love the look of a round loaf. Thank you so much for this article collection. It’s definitely very useful. I’m wondering what Oster bread machine you purchased. Is it the CKSTBRTW20, 5838 or CKSTBR9050? You are so welcome Lynda. My breadmaker is the Oster CKSTBRTW20 here is an affiliate link to the machine if you are interested in getting your own. http://amzn.to/1Tb7Z6h It is a great breadmaker that is super easy to use. LOL! Thanks Robin! I’m glad I could help you with your shopping list! My family is addicted to bread! I should buy a bread machine. Thanks for posting on the Merry Monday Link Party. You really should Erlene! They will love you for it!! I’m not much help Judith, I’m sorry. Try googling the make and model of your breadmaker and should be able to find instructions. I love using my bread machine. Thanks for sharing information. I’m sorry Amy, I no longer have that recipe. It wasn’t mine, I simply linked to it and the owner removed it so I was no longer able to link to it. I love making bread using my bread maker. Would love to try ur bread recipes n others too. Thank you Lilyn! I hope you enjoy some of these recipes! thank you very much for the article and keep up the good work.